Meerut building collapse: In Uttar Pradesh, India, a building has demolished without any proper notice on Saturday (July 9, 2016). Because of this incident, Four people were dead and three people were injured. 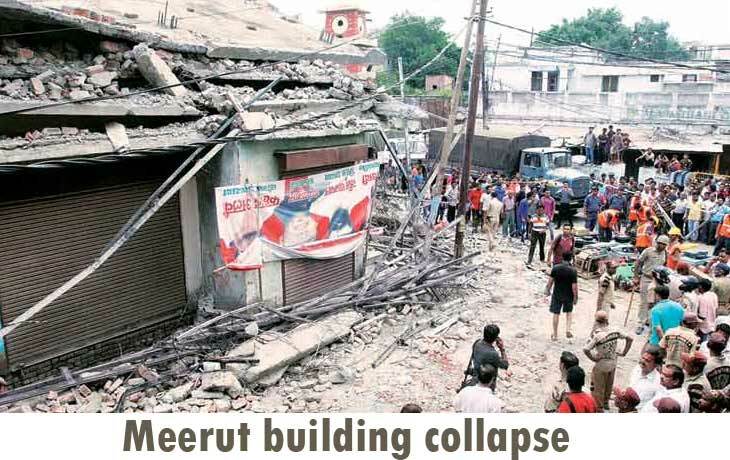 The Meerut corporation started their demolition drive without any advance notice to the local people. Due to this process, four people were dead in that spot itself and three more people were severely injured. The corporation started this demolition drive in the anti-encroachment area of Meerut. The National Diaster Response Force (FDRF) reached the spot along with the 42 members to rescue that local people and also they controlled the situation. All the local people were asking that now they can start this action without any previous notice and without our vacation from that place. Where the injured people were admitted to the nearest hospital and the dead people bodies were send to the post mortem.